Hubert von Goisern. 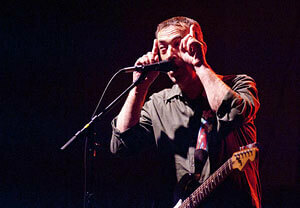 The singer-songwriter gave a concert in Ulm. 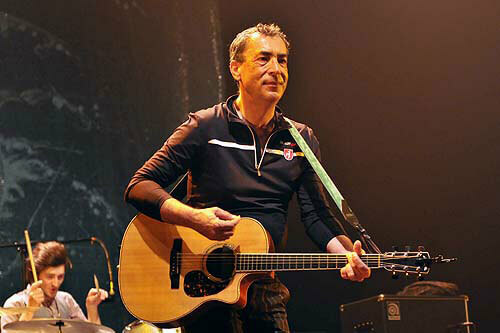 Alpine rocker Hubert von Goisern presents himself as a singer-songwriter of world format with his trio in the Ratiopharm Arena. 3000 fans were thrilled with the bitter-sweet ballads and rousing rock from the Upper Austrian. Neu-Ulm. Paganini mastered just the one instrument to unbelievable heights, the Austrian all-rounder shines live as a multi-instrumentalist who amazes: the accordion, with which he became famous, is mastered blind just like the electric and acoustic guitars, the assistant in the background has his hands full giving the artist the varied range of instruments: on a tray stand shiny gold cow bells, as if paying homage to the king of Austria, the little e-piano, the lap steel guitar, clarinet, Jew's harp and harmonica, only the Asian noseflute, at which he is also proficient, has Hubert von Goisern left at home. It might sound like a musical circus, but with this arsenal Goisern conjures up wonderful music in all its facets for his songs, from rousing rock to bitter sweet ballads. Entwederundoder is the name of the new album with which Goisern is currently touring through Europe. Skinned music he calls his new songs, which make you think, if you understand the dialect. And so the anti-capitalistic protest song Brenna tuats guat instantly became an Austrian chart-topper. This song ("everyone knows that money doesn't grow on trees and you can't eat it either, but it burns well) is preparing to conquer German hearts and is currently being played nonstop on German radio. For songs like this, the youthful-looking artist doesn't need an orchestra, but rather no more and no less than three very young Upper Austrians. The drummer Alexander Pohn, who looks like a young Beatle, Helmut Schartlmüller on bass (the young Ötzi must have looked like him) and the sensational guitarist Severin Trogbacher, who has the haircut of a zen priest and develops a temperament on his instrument as once did Jimi Hendrix: folksy daredevil music that makes the floor shake, sensitive blues, groovy jazz, hard rock and spiritual sounds that have inspired the composer on his travels in India, Tibet and Africa. The audience appreciated the new pieces from this multifaceted and modest singer-songwriter, who didn't go professional until he was 30, and straightaway sang along with songs like Indianer: "Sie hab'n Pfeil, sie hab'n Bogen – sie hab'n riesige Hoden" ("They have arrows, they have bows, they have enormous balls". Hubert von Goisern, apostrophised as an alpine rocker, begins his fascinating evening of song with a farewell to winter and just before the end plays his current hit Brenna tuats guat. Beforehand the brilliant singer-songwriter put his fans in bliss with ear worms like Weit, weit weg and sparkled between the songs as a witty storyteller with stories from his musical life about the dark side of the clarinet, his hometown Goisern with 7000 inhabitants and seven brass bands and lots more. The two hours of concert flew by and after three encores this concert ended almost solemnly with an a cappella finish: that's the way it is. Hubert von Goisern live, that doesn't mean sitting on still waters, but rather on a tempestuous mountain torrent that can pull you under at any moment. Of course there is a relieved sigh from many of the 3500 visitors on Friday evening in the Passau Dreiländerhalle when he plays Heast as ned oder Weit, weit weg. But his classics don't suit him any more, the 59-year-old is happier with his new lyrics and melodies, which are strongest when they extol simplicity. A belting cry to "Heidi", the longing waltz "with a quarter more" that he hasn't been able to forget since he heard it from beneath a tree "that had just come into leaf" and the unemotional farewell that had to be the only word of a final goodbye, although "the letter I wrote you is still here". His first great big hit is nonetheless always there wherever Hubert von Goisern goes. "Sing Hiatamadl, Hubert! ", bawling calls that the musician beautifully ignores and starts one of his new pieces, which could as well be raw rock as have strong-willed depth. One fears for a moment that Hubert von Goisern could react with irritation to the heckles, but he simply sings the fears away. Hubert Achleitner, as he is really called, will be celebrating his 60th birthday this year and a number of his fans have grown older with him. Yet the Austrian has managed to tie in a very young audience too, which might not only be down to his fresh number one hit Brenna tuats guat, but also the fact that Hubert von Goisern has never stood still. "I'm up and away, I must go, I have to get out of here!" 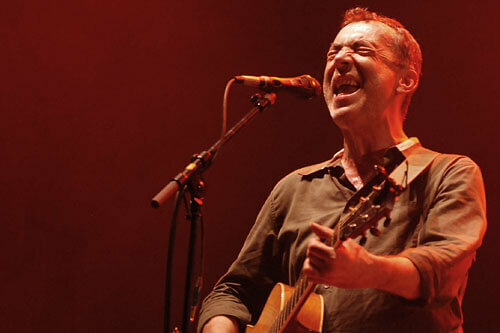 the singer-songwriter sings of his constant departures. Nobody has the ploughed up the ground of folk music to allow new growth as dependably as he has. Three young guys - his band of drums, guitar and bass - make Hubert von Goisern look like their father. They are a good reflection of the age differences in the audience this evening. A four-voiced yodel shows what the guys have learned from the master. The quartet quickly changes to from polka to ska rhythm, effortlessly following juchitzer jazz. Just as virtuosic as he plays the accordion, harmonica, bells, guitar and piano, Hubert von Goisern just as coolly tells stories of his youthful reluctance towards the clarinet, which in contrast to his beloved trumpet, he had to hold downwards: "Having to play for the moles, was too unmanly for me - in puberty". Now he respects the clarinet, he can't love it, but the instruments are all one big family. A family in which he is at home. Don't be fooled by the coolness though: in his musicality Hubert von Goisern is a perfectionist. Nonetheless, up on stage the artist is accessible for the audience, because he knows to celebrate his dialect. Gnarled authenticity is the trademark of Hubert von Goisern and his powerful shows. Because his "thank you" after every applause sounds so honest, the audience calls the same back to him at the end of the evening. 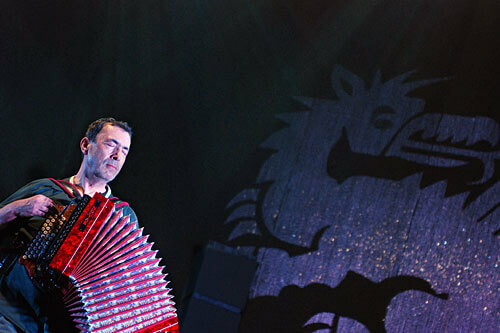 On Thursday Hubert von Goisern really put his foot down with his accordion in the Olympiahalle. But the quieter tones sounded too. Innsbruck – The man is unbelievable and in many ways. The music from Hubert von Goisern is as classifiable as the man himself. Is the Upper Austrian bringing world music to our ears now, or is it new folk music or alpine rock? It's not important. 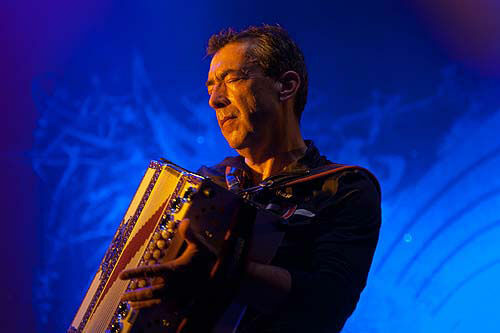 What's important is that Hubert von Goisern had the audience in the palm of his hand with his sound, a combination of traditional folk music with modern elements. He opened the evening with a long musical intro, the piece turning out to be the Upper Austrian anthem. "Durih's Tal bin i glaffn, Afn Hechl bin ih glegn, Und dein Sunn hat mi trückert, Wann mih gnetzt hat dein Regn", Hubert von Goisern sings. He presents himself on this evening as both connected to his homeland and cosmopolitan. 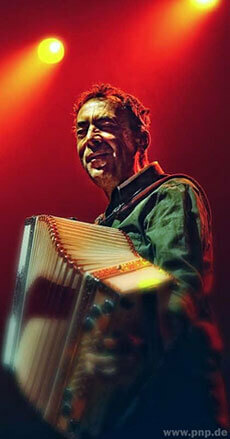 His tours and musical journeys have led him through Europe, the USA, to the Arab world, Tibet and many times to Africa. Chauvinism isn't his thing. "There's no people that is completely easy-going," he says. He laughingly counters the boos and whistles: "It's funny, you only get this rebellion in Bavaria and Tyrol. Nowhere else do people think they're perfect." The people are of all ages, from youths to the seniors, the latter arming themselves with earplugs against the high volume. Hubert von Goisern introduces his songs with witty stories. At first there are tasters from his new album EntwederundOder, which has been awarded gold and platinum. Hubert von Goisern is in the running for the Amadeus Award, the Austrian music prize, with three nominations. As far as his current super hit about the banking crisis is concerned, he lets the audience stew until the end. Brenna tuats guat was at number 1 in the Austrian charts for five weeks. But the popular tune isn't missed for a second. Hubert von Goisern is pure musicality. He masters not only his favourite instrument, the accordion, but also provides an interlude with cow bells, plays virtuoso guitar and Jews' harp and even takes up the clarinet. An instrument that he came to quite late, he says. In his hometown of Goisern there are 7000 people and seven music bands. So it wasn't too bad when he was thrown out of one for being cheeky. Another one took him in and wanted to persuade him to play the clarinet, which he didn't like. He calls the song that follows an atonement. 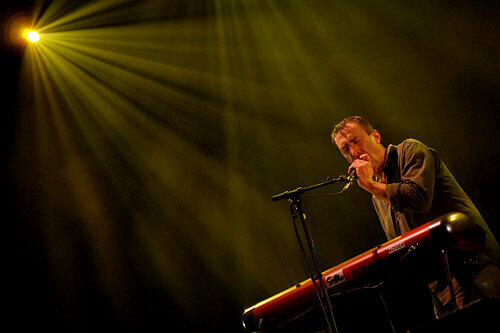 The musician, with an excellent band, alternates between rocky, earthy sounds and delicate, poetic songs. The audience follows him, but for one heckler, who calls: "Hubert, put your foot down!" It is the quiet numbers that cast a spell over the listeners. While the audience was rather reserved at first, they let themselves be carried by Weit, weit weg, singing along with the chorus and - holding their lighters aloft - yes, there are still people who burn their fingers. Then things reach boiling point in the Olympiahalle with the instrumental introduction to Brenna tuats guat. The audience likes it and don't want to go home and demand three encores. With Heast as net as well as a four-voiced yodel, the Upper Austrian then says goodbye with a "thank you for the lovely evening". That can only be said in return. 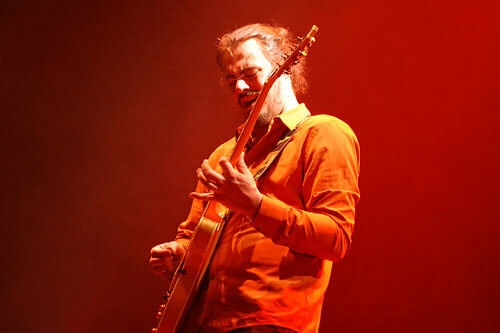 On Thursday Hubert von Goisern rocked the Innsbruck Olympiahalle. Innsbruck – His new album EntwederundOder was awarded gold and platinum and on Thursday Hubert von Goisern rocked the Innsbruck Olympiahalle. 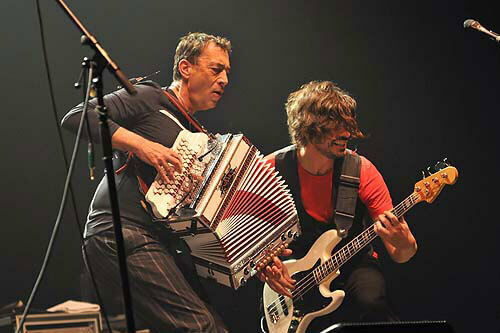 The musician playfully combines traditional folk music with modern elements and foreign instruments. Hubert von Goisern left the audience at his Innsbruck concert feeling completely satisfied. Slow songs alternated with numbers in which the drummer became a professional athlete. No wonder that the audience didn't want to let their Hubert leave the stage. They didn't have to twist his arm and were treated to three encores. The evening ended with Hearst as net and a four-voice yodel. Mülheim. "Servus Mülheim!" 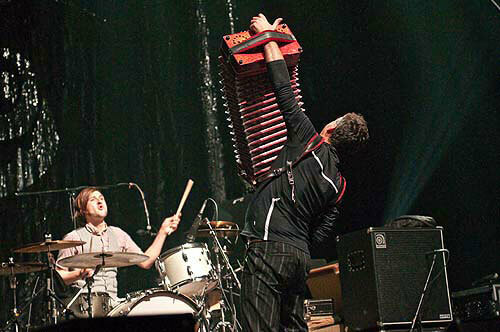 Hubert von Goisern calls to the crowd and stretches the accordion to its full length. The Ringlokschuppen is sold out. Around 900 people have come to see the alpine rocker, who's approaching 60. It's mostly the 50++ generation that's dancing so exuberantly: women with curly hair and grey-haired gentlemen in checked shirts, with no lederhosen or dirndls either. If anyone can move mountains, then it is Hubert von Goisern with his music. On his Entwederundoder tour the musician from Upper Austria brings the sounds of the Alps to the Ruhr, where a wave of sympathy washes over him. And it's not just the current hit Brenna tuats guat (It burns well) that sets the huts ablaze. The audience sings along with the refrain of the song critical of the banking crisis: "Everyone knows that money doesn't grow on trees, and you can't eat it either - but it burns well." The atmosphere in the hall burns for a music with its own tone, rousingly paired with fantastic rock, jazz, blues and yodels and driving ska rhythms with cow bells, as well as tender, quiet songs full of poetry and melancholy. The audience lets itself be carried Weit, weit weg (Far, far away) and even sings along with the refrain. They are songs about life and its transience to which the wander between worlds has given a melody through experiences and feelings for home. They transport messages such as having more compassion for cooperation in Europe. 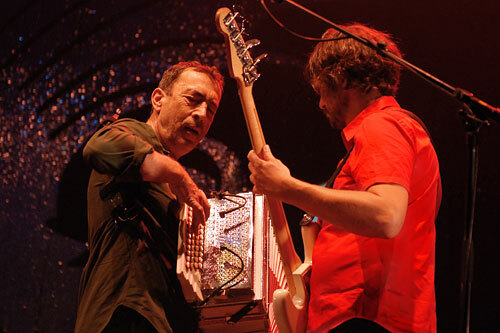 And HvG, who himself plays instruments including the accordion, guitar, Jews' harp and clarinet, shows a successful cooperation on stage too with his young, punchy band. After opulent orchestral instrumentation, the band is smaller now with drums, bass and guitar. The born Goiserer, whose real name is Hubert Achleitner, has returned from world music to his roots with skinned songs. He has remained authentic and does his own things. As always he raises his voice for tolerant cooperation. Communication difficulties arise at most due to the dialect. But as it symbolically goes in a song: "I don't need to understand everything, but a little would be good." Bielefeld. "When the sun comes again and the snow melts away and your shoes sink into sludge, then everything drifts", the alpine rocker Hubert von Goisern sings of the end of winter and the course of things and on his Brenna tuats tour brings a colourful folk mix and lots of musical aptitude for spring feeling in the well-filled Ringlokschuppen. After the sumptuously instrumented Danube tour and his epic last album S'Nix, Hubert von Goisern has now come to a radically reduced musical essence on the current record Entweder und Oder, which the almost 60-year-old could, if needs must, present alone with his guitar. But the songs are lightly dressed with drums (Alexander Pohn), bass (Helmut Schartlmüller) and guitar (Severin Trogbacher) and make for a cosy concert atmosphere. Far from the Alps it is sometimes difficult to understand. The lyrics in Upper Austrian dialect leave holes that challenge the listeners' power of imagination. But it doesn't matter, von Goisern says: each person should simply interpret what they want from it. What's important is the sound, composed of different music styles. Next to folksy schlager, elements of blues, jazz and rock find their way in, as well as sounds from far away, inspired by his stays in India, Tibet and Africa. 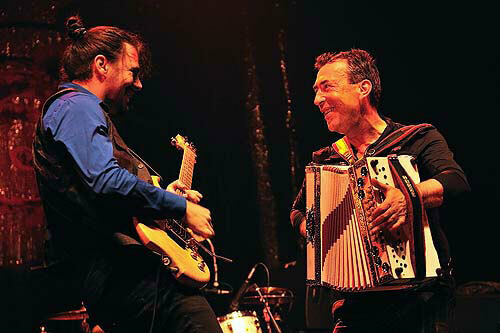 Hubert von Goisern is an instrumental multi-talent: live he plays accordion, electric and acoustic guitar, lap steel, electric piano, Jews' harp and harmonica, in turn and together. Nothing comes from tape. The singer from the Salzkammergut is also convincing with the set of songs. Aside from new songs Es is wias is, Heidi halt mi and Indianer mainly older hits are broadly popular. During Weit weit weg the Goisern fans sings fervently along and sound like a seasoned male choir. Perky dance rhythms interchange with serene ballads, breakneck turns and swaying pauses: the atmosphere dances waltzes. Between the songs the seasoned musician gives away some secrets, telling little stories about how the songs were written, personal anecdotes from 25 years in the music business and funny things from back home. Hubert von Goisern is authentic, lively and passionate. The audience give their thanks with lots of applause, and because they've still not had enough after 140 minutes of concert and a few encores, the quartet sings another a cappella number. "That's how it is": good. The longing for the Alps lives deeper in the hearts of the local lowland Tyroleans than generally believed. There's no other way to explain the many people who waited to be let in in a long queue outside the Admiralspalast on Monday evening. The ones in traditional clothes are obviously Austrian in the Berlin diaspora, who want to see their fellow countryman, who lasted played here in 2008. But the others, variously dressed in all-weather vests and plaid shirts, must be fans of the Salzkammergut, who regularly holiday in Bad Goisern am Hallstätter See and climb the nearby Dachstein Massif. Despite the streaks of grey in their hair, the lusty characters stream swiftly into the hall and start, as the lights go out, to scream and shout. Hubert von Goisern, who doesn't look a scrap of his almost 60 years as globetrotter, is their role model. A few months ago the world musician and sound-experimenter von Goisern, who founded alpine rock with the Alpinkatzen band 25 years ago and helped create new folk music, released his new album Entwederundoder. Just like the single Brenna tuats guat, it did well in Germany too. In Austria it went gold straightaway, the singer-songwriter after all being a national cultural treasure, though one of an awkward kind. The head of the brass band in Bad Goisern had to realise that, throwing the young trumpeter Hubert - who was still called Achleitner back then - out of the band, because he wouldn't cut his long hair. "Those were simply authoritarian times back then", Hubert von Goisern says to the auditorium as he tells the story. Goisern is constricting and the world is wide open for someone like him who has lived in Africa and Tibet. And in his peripatetic music of skipping country dances, blues, rock, jazz and yodelling, one hears that only those who have been away really return home. It is a cracking evening beneath a shining dragon banner, which is both the heraldic animal for Bad Goisern and the musician. 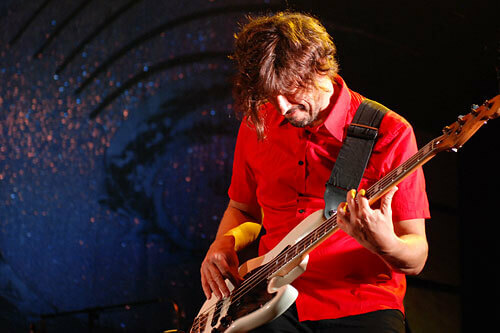 His band of three Upper Austrian hipsters, who are all half as old as their boss, go to work with precision and devotion on drums, bass and electric guitar. 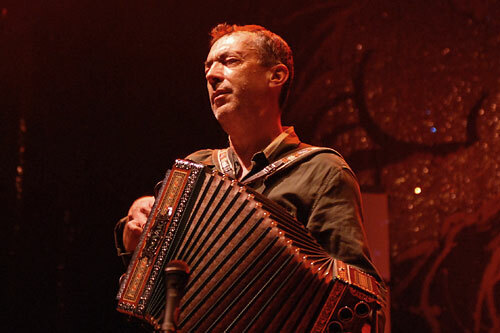 And any instrument that's missing is played by the astounding Hubert von Goisern: accordion, clarinet, Jews' harp, acoustic guitar, lap steel, electric piano, cow bells. A stagehand, who later dances a kind of "Holzmichel", brings them to him. But the greatest miracle happens when the birds of passage in their all-weather vests and checked shirts, who previously swayed spiritedly together, sing along to the von Goisern classic Weit, weit weg in fluent Austrian dialect. The mountains can't be seen, but nonetheless they are very close. Enough of the fake homesickness - for the finale the band cleans any kitsch out of the ears with absurd country dances on speed. Outside the hall on Friedrichstraße, it resounds still powerfully. There is ostensibly a lot of oompah, but behind it lies a clever mind. 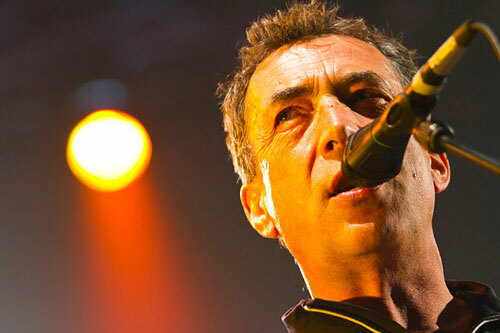 Hubert von Goisern is 59 years old, and the yodel rocker can still pull in the crowds. Even in the north. 1300 people filled the Capitol Hannover. The Austrian from the small town of Bad Goisern achieves a remarkable balancing act. With his most recent hit Brenna tuats guat he made it to number 1 in the Austrian charts and even into the German single charts. And thus he landed in the loudspeakers of the outdoor bars of many ski resorts, where "schunkeln" has never ceased to be cool. However it's worth listening more closely. Von Goisern's lyrics are of a fine nature, at times love songs, at time socio- or politically critical, poetically dressed up, though barely understood in the Capitol due to the dialect and and difficult acoustics. What luck that many people in the audience know the choruses of their favourite songs by heart and don't need much encouragement to demonstrate the fact. Even when the multi-instrumentalist Austrian isn't playing or singing, it's good to listen to him (and even understand him). There is so much to tell about his first brass band and being thrown out, because he couldn't keep his trap shut. He likes talking nonsense about all the saints and what people hope of them - from St. Clement to St. Michael. About the foibles of the "Über Upper Trans-Austrians" and the people of Hannover, who can't agree whether the river running past the Capitol during the concert is the Ihme or the Leine. Whereby the Capitol stands more at the centre of the Ihme than the Leine. From song to song Hubert von Goisern takes a different instrument. 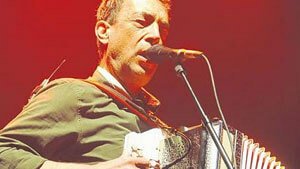 Leading the way with the accordion, guitar, keyboard and at times the harmonica and even the clarinet. The latter he uses for smooth jazz and blues sounds. It's wonderful how he rewrites Hoagy Carmichael's good old Georgia on my mind into Goiserish. A homeland song from someone who has gone out into the world and yet remained genuinely faithful to Austrian folk music. A young trio supports him along the way, Alexander Pohn on drums, Helmut Schartlmüller on bass and Severin Trogbacher, who wrests catchy solo melodies from his guitars and also really rocks when needed. In the programme are Goisern songs from earlier times and lots from the new album Entwederundoder. Nit lang her, Weit weit weg, Lebwohl, Neama Bäng and lots more - alongside a number of anthems comes folk music, calling forth inevitable rustic shooting festival associations and yet coming straight from the heart. At the end after a number of encores there is a four-voiced a cappella yodel. A "heartwarming evening" says Hubert von Goisern of the show. Passt scho. That'll do. "Brenna tuats guat" ("It burns well"). And at 9.53pm things are burning especially hotly in the E-Werk. The moment the four video walls on stage show red, glowing flames, the audience knows with what Hubert von Goisern will be lighting the way home. 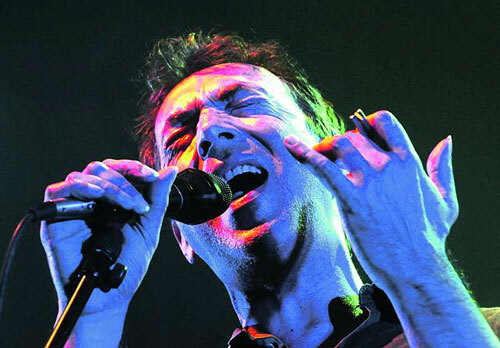 With the fiery song from his current CD, Entwederundoder, released at the beginning of September 2011. The single and album as well as the artist himself in the category Pop/Rock are nominated for the "Amadeus Austrian Music Award", Austria's biggest music award. The Goiserer, who'll be 60 in November, is a real evergreen, even in his later years. Since 1986 when he founded the Original Alpinkatzen with Wolfgang Staribacher, and made it really big with the band six years later after separating from Staribacher. His musical mix of homeland folklore and world music ensures him a colourful audience and that holds true on Saturday evening in the full to bursting E-Werk, which had been sold out for weeks. Side by side stand women with dreadlocks and turbans next to polo shirt-wearers, dressed up friends next to families in jeans, the guys in eco-look next to those who probably don't even take their old leather waistcoats off in bed. 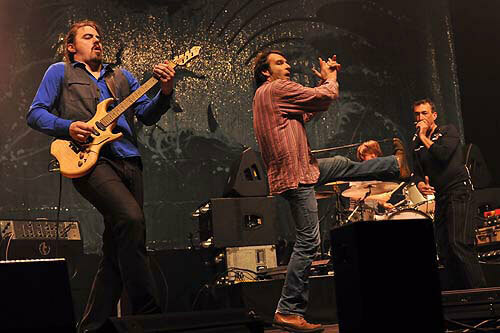 With a small band - Alex Pohn (drums), Helmut Schartlmüller (bass) and Severin Trogbacher (guitar) - and blazing songs from Entwederundoder Hubert von Goisern is huge in the E-Werk. A galloping cowbell ska evokes the Indians, in Es Is Wias Is the frontman pays his penance with great feeling to the once much-maligned clarinet and in Heidi Halt Mi there is indeed no holding him any more. Entwederundoder comes up with folk, blues and reggae, sometimes sounding like waltzes and sometimes like jazz, and really gets you moving. The fact that the atmosphere is really cooking even when older songs like Goisern and Iawaramoi come into their own, is certainly not by chance. There are many true fans in the audience, some of them have even come specially from Styria, Carinthia and Vienna. When he's not singing, yodelling and scatting, playing the accordion, Jews' harp and harmonica, the short-haired Alpine Cat chats about previous shows, his relationship to gambling, religion and language and about his false start as a young trumpeter in a brass band in Bad Goisern. It would be great to reproduce this verbatim, but unfortunately we're drastically lacking here in Upper Austrian orthography. 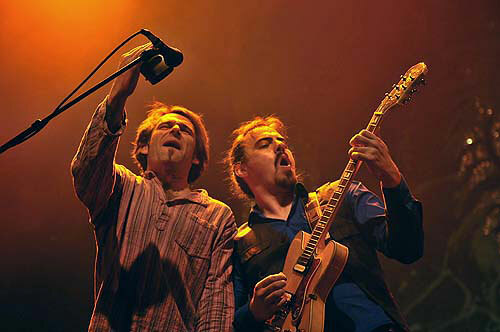 Hubert von Goisern and his band set the Erfurt Stadtgarten ablaze with alpine rock and alpine reggae. Erfurt. "Where's the barn, where's the hut that's burning?" No question: it's clearly in Erfurt. On Sunday evening Hubert von Goisern set the Stadtgarten ablaze with his three man band and an arsenal of highly explosive pulled blown and plucked instruments. In front of a sold out hall, he ignited a firework of new songs and global-Austrian works and sparked off great enthusiasm: it burns well. Typical Hubert von Goisern, you could say - except that this multi-instrumental talent refuses to be typecast. If it's right that the man invented alpine rock, then alpine blues, alpine jazz and alpine reggae need to be added to account too. To say nothing of alpine Tex Mex with a cow bell solo, as to be heard in the wicked character study Indianer; only one person can do this - at least at this speed. 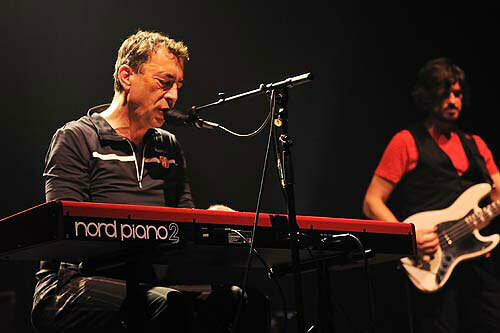 There's no style that Hubert von Goisern and his Upper Austrian accomplices can't master, barely an instrument between Jews' harp and keyboard that the band leader, true to the tour motto of Eitherandor doesn't play. Even the clarinet, "for a long time my own bogeyman", is good for snuggly bar jazz. For the blues song I versteh di nit comes a lap steel, "there's no German word for it", von Goisern declares defiantly and makes the steel mini guitar sound as dirty as Mick Jagger's best blues harp solo. And when Goisern's button accordion holds a duel in Heidi halt mi with Severin Trogbacher's lead guitar, powerfully underscored by Helmut Schartlmüller's bass, then only winners are left at the end. In between time Hubert von Goisern holds forth on the advantages and disadvantages of being invisible, the usefulness of saints and on being an Upper Austrian. His storytelling tempo is leisurely, and his crescendo is just as unleashed, as he revs up a Styrian polka on the harmonica: "We play this twice as fast as the Styrians ... can!" Janis Joplin's Mercedes Benz drives up as a reggae and by Brenna tuats guat at the latest, half the Stadtgarten is dancing; drummer Alexander Pohn giving the solo. A wonderful evening between alpine ballads, alpine guitar pop and alpine funk. 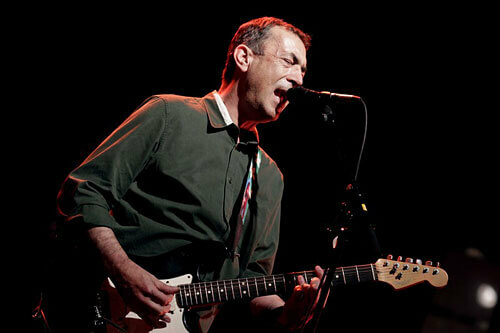 Those who missed it should note the date 5th August, when Hubert von Goisern will be playing in Creuzburg. Melancholic, wistful and introverted, on Friday evening Hubert von Goisern took his audience in the Alter Schlachthof away with him on a little trip into the mountains - where up on the peak your heart can beat freely and the idyll lets all worries melt into the background, where a connection with the homeland and folksiness all too often make howlers and painfully sharpen their powerful dagger before plunging it with relish into the flesh of the adversaries. But all those who can't imagine giving even a moment to traditional alpine music could be turned into folk music fans by Hubert Achleitner from Bad Goisern. For the Upper Austrian is the hero of folk music, dusting off, reissuing traditional alpine music or exposing puristic bodies of sound since the end of the 80s. He can't lie that it is difficult to give one's heart to this music in a relaxed manner. His own social roots in the village brass band show him that again and again and allow him to touch the keys of his accordion with particular commitment. Hubert von Goisern was far, far away and has settled down and broken free again. Conventions are not necessarily a dogma for him, he combines tradition and worldly ideas into his own folk music, no alpine rock kitsch, no embarrassing lederhosen blabber, instead he spreads joy for life and is one of the most progressive cultural ambassadors that Austria has let loose on the rest of world in years, without the state suspecting what kind of wave of enthusiasm would be set off. So he yodels, tells stories and sings his way into the hearts of fans of jazz, world music and the alpine world, always transporting a vital impression of simple life and the imaginative music. Achleitner packs everyday experiences and encounters into not just music, he tells stories, talks about everything under the sun, scrutinises holy figures and the variety of instruments, tells the audience why he has a split attitude to the clarinet, only to put it to his mouth a moment later, open the valves and make the columns of air swing, different from and more interestingly than would have been possible with a disdainful, shining trumpet, melodious, without any sharp rhythms. But That's the way it is - anyone who was give the clarinet as a youth in Upper Austria was quite clearly not seen as especially cool, because the signal came from the guys with the trumpet, today an advantage, back then a terrible burden to be borne. At almost 60 years old, Hubert von Goisern is very cool, standing as presumedly the only brass musician from Bad Goisern in front of two, three thousand fans and can put into action that of which every backbencher dreams his whole life. He can express, entertain and present ideas that are at times very quiet and then must be captioned with Can't you hear, in order that there is no danger of being misunderstood. In contrast to this, in the second half of the concert Goisern puts in more swing in the sense of It burns well. Anyone who had until now defied the language barriers and had here and there trusted the music alone, because they didn't understand anything, was rewarded from this moment on with a foundation course in exhilaration. Incidentally, on 23.11.2012 there will be another "training course" in the Alter Schlachthof with Hubert von Goisern and the appropriate international commitment. Essenbach. 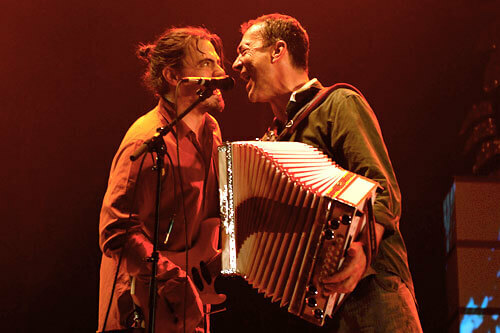 This is how his audience loves him: Hubert von Goisern with accordion or Styrian, with Jews' harp, guitar, keyboard or clarinet. Added to that rocky basses and guitar riffs and defamiliarised folk music, mixed with music from all over the world. "The shepherdess has emigrated", says the musician as the fans call for him to play this piece. But his familiar style is back again, "skinned" to the bone, accompanied by just electric guitar, bass and drums, he lives his songs passionately, wildly and sometimes lost in thought and tenderly. On the one hand he is congenially accompanied by three young musicians, on the other hand time and again he gives them space to improvise, to play off their great musicality. On his Brenna tuats tour, on which he mainly presents the songs from the new album entwederundoder, there are many deep and critical lyrics that play a less significant role during the live concert than they really deserve. Live Hubert von Goisern takes his audience with him on his musical journey, here what counts are rhythm, music, atmosphere and short stories in between, with which he connects the individual pieces. 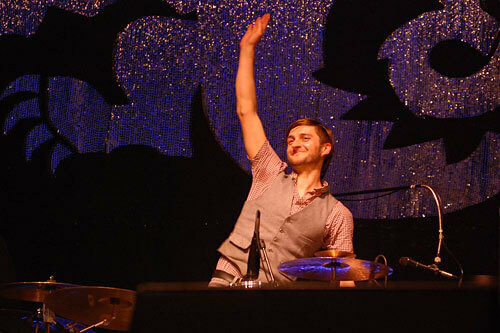 And the audience thanks their Hubert, the hall bubbles, people dance, clap and sing. But the so successful song Brenna tuats guat, for which he was awarded platinum in the new year, is to be taken as harsh criticism of society and their dealings with truth and money. No matter, it's simply great for dancing. After long applause there are Weit, weit weg and Heast es net as encores. His musicians prove that they can sing well in the very last encore, an à cappella four-voiced yodel, with which Hubert von Goisern and his band say goodbye on this evening once and for all. The 2500 listeners experienced a cheering concert to which they listened, felt and grooved along. FRANKFURT. Hubert von Goisern (59) decisively shaped alpine rock with his Alpinkatzen (1984-95). He has also explored countries, people and folklore all over the world on extensive journeys of self-discovery. He presented what he has gained on Tuesday evening in Frankfurt. A quartet of lads tramps through a country dance with measured, weighty sounds - stolid, with legs wide spread, as if sleepily returning home from the shooting fair. The band is completely electrified, but nonetheless, whenever they want to, sounds like original alpine folk music. The bass guitar profoundly and powerfully amplifies the over-emphasized cellar basses of the accordion so it sounds like an alphorn, the electric guitar chirps like a zither, the drum roar could be from the drumming group of a marching band. The audience from the Rhine-Main region can only understand the singing if they've "read up", as the singer comments after the first piece - certainly his fans know every one of his sometimes rough Upper Austrian turns of phrase. This is how Hubert Achleitner is loved, the man who calls himself - in honour of his hometown of Bad Goisern - von Goisern, accepting that it could be mistaken for an assumption of a title of nobility. Misunderstandings follow him anyway, the shining entertainer explains mischievously: when he for example - changes Ray Charles' Georgia On My Mind to "Goisern - oh Goisern", he's not singing a song about himself, as a woman implied in a letter to him. 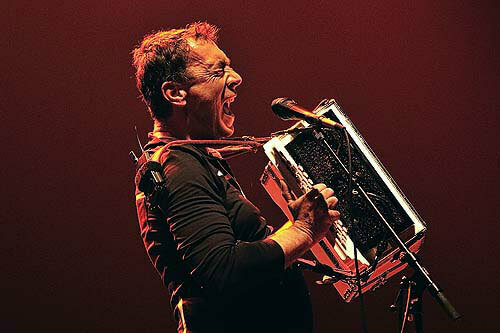 Other people have accused him of vanity because he plays different accordions in his shows - sometimes a red one, sometimes a white one. That's why he hasn't even unpacked the green one yet, he teases - and says that he doesn't even play a (chromatic, capable of multiple keys) accordion, it's a diatonic ziehharmonika and with this instrument you need different instruments for different keys. 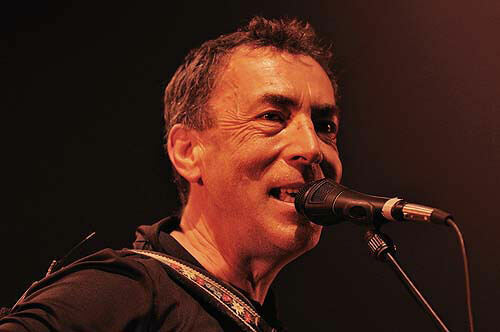 Without a doubt he also plays the multi-instrumentalist, playing solos on the lap steel and guitar - although he has an excellent lead guitarist who can take on any folk and hard rocker -, harmonica, Jews' harp and glockenspiel, clarinet and keyboard. He has an anecdote up his sleeve for every instrument and with each represents a suitable style between blues and folk, rock and reggae. And a special atmosphere: from bitterness and melancholy, to lost time and lost love ("You're so far, far away from me") and blunt gallows humour, always sounding deeply human ("whether Serb or Croat, it's a pity for all ..."). Hubert's oratories can, nay, must be taken seriously, even when he takes his German version of Mercedes Benz far beyond the Janis Joplin template and right up to the edge of blasphemy, begging for "a lovely Daimler", as well as eternal life and a halo too: "Lord, it costs you nothing". With ear-numbing noise attacks and thrashing stroboscopic storm the band enacts the wrath of the Heavenly Father. And Hubert becomes deadly serious again, pondering the passage of time and the deeper meaning of life. 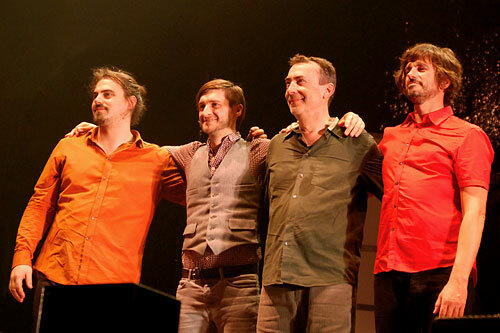 In order that nobody hurts themselves on a patch of black ice of tears in front of the hall, he says, playing on the heavy frost in Hesse, in the last third of the concert the superbly well-rehearsed band lets alpine rock furiously crash again. Schottische and country dances chase each other, multi-voiced yodels and minute-long ludicrously fast, shimmering guitar races take turns. The four Upper Austrians gather for a final encore of a multi-voiced yodel hymn - like the whole concert, in perfect harmony, with a lot of warmth and a big shot of pleasant self-deprecation.